Fans have accused Theon Greyjoy of lacking testicular fortitude in his decision to jump overboard during the fight with Euron Greyjoy. In truth, jumping overboard was the only way to stop Euron from killing Asha. Theon stood several feet away as Euron held the blade of his ax against Asha’s neck. 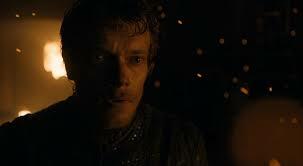 Theon spent several long seconds hesitating and seemed to be considering his options, of which he had a few. 1)	Charge Euron – If Theon had charged Euron, Euron most likely would have killed Asha before fighting Theon. 2)	Challenge Euron – Theon might have said to Euron “Let Asha go and fight me.” But of course if Euron had done so Asha likely would have got involved in the fight, so Euron would not agree to that challenge. If anything, he probably would have killed Asha by way of an answer. 3)	Offer to surrender – This option offered a higher likelihood of Asha surviving, but with no one left to rescue either of them. Self interest undoubtedly played a role in Theon’s decision, but running away also gave Asha her best chance of survival. With Theon free, Euron at least had a threat (albeit a small one) which gave him cause to keep Asha as a hostage. Theon Greyjoy is still broken in many ways and he is certainly not the person he used to be. For a while it seemed Ramsey broke him so thoroughly he would forever remain a slave, but Theon found that missing piece of himself when Ramsey hurt someone he cared about, Sansa. But what is broken can sometimes be, at least partially, put back together again. Next Is Disney Weaponizing Its Fanbase?